All types of burns can cause pain. First and second degree burns are more painful in the beginning, with pain even when air flows across the burn or when clothing touches the burn. After a few days, the pain can change in character to be more of a dull pain from inflammation and swelling deep to the burned areas. Third degree burns are more confusing. They initially cause little pain to pinpricking but patients with third degree burns are likely to experience deep, inflammation-related pain. As the eschar falls off, there is an increase in pain during pinpricking and there comes a pain related to the nerve endings in the dermis growing back, causing pain of a different quality. Because of the inflammation around the burned area, the area of the body involved in pain can be the surrounding tissue as well as the burned area. Burned tissue releases a lot of pain mediators such as interleukin, which intensifies the perception of pain following a burn injury. 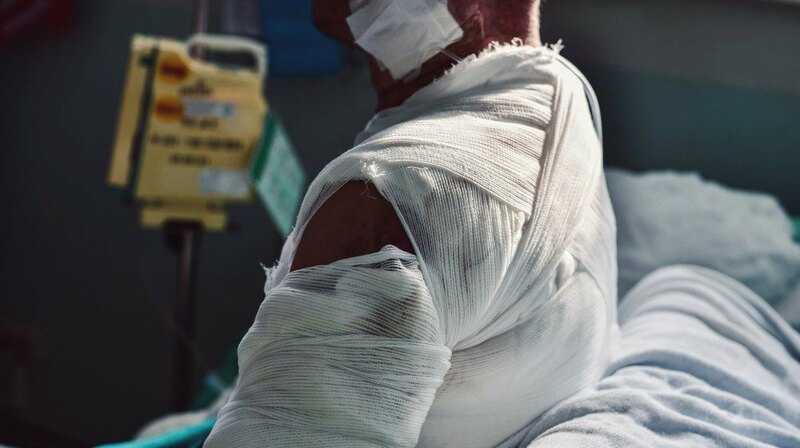 Burns can be painful even at rest because of the psychological and emotional issues surrounding the burn; there is little correlation between the size of the burn and scores of the amount of pain a person is having. Patients with burns often have a great deal of anxiety related to times when the burn needs to be treated and the anticipation of pain during treatments. These same patients can experience depression related to anticipation of pain treatments. The depression sets up a vicious cycle, where depression increases the perception of pain, which triggers more depression and more pain. This cycle can be broken by adequately controlling the level of pain the patient is experiencing. Patients with full thickness burns need to have the nerves regenerate before the full degree of pain is experienced. Regardless of the methods used to heal pain, the process of nerve regeneration occurs about 5-6 weeks following the injury but can take up to 6 months for the nerves to completely regenerate. During this time, there is neuropathic pain, which is directly related to the healing of the nerves around the burned tissue. Some people can develop chronic pain syndromes such as causalgia and phantom pain after a burn. This is more likely to occur when the burn is allowed to heal secondarily rather than through excision and grafting. Phantom pain is also more likely to occur when a limb has had to be amputated due to severe burns. If the patient does not develop any of these chronic pain syndromes, eventually the pain may subside over several months. Measuring PainMeasuring pain can be difficult for burn patients as the degree of pain is different during the various burn cares necessary for the treatment of burns and during times of rest. The pain difference can be so significant that there needs to be a reassessment of pain needs during times of actually working on the burn during cares and times of rest. Pain scales are often used for this purpose and can be rated on a scale of 1-10, 0-5 or just using pictures of faces experiencing varying degrees of pain. This latter technique is most useful in children who identify better with pictures than they do with number scales. Offering the patient the opportunity to describe the level of pain on a scheduled basis is important. It can help determine the schedule of giving pain medications and shows the patient that the staff really does care about the patient’s perception of pain and knows that pain is part of the patient’s problems in a burn unit. Regularly asking about and providing pain relief based on pain scales can reduce the level of anxiety around pain that most patients experience. In adults, the best way to measure pain is to ask them to rate the pain on a scale, such as 0 to 10. Another way of doing it is to use pictures showing faces in varying amounts of pain. When asked, the majority of patients preferred using the faces scale to determine their level of pain. In children, especially those who cannot talk, it is more difficult to assess pain. In such cases, behavioral scales have been devised that look at crying behaviors and facial expressions observed by the staff which indicate varying levels of pain. There is a special pain gauge called the Children’s Hospital of Eastern Ontario Pain Scale. There is also a pain scale called the “Observer Scale”. Both of these techniques are good ways to identify the amount of pain in children who cannot tell the staff how much pain they are in. The OPAS or Observational Pain Assessment Scale has also found to be good in telling how much pain a child aged 0-3 is experiencing. Anxiety and itching are other phenomena that happen during the healing process of having a burn. There are scales using pictures and/or numbers that can be used to assess these features of healing burns. Treating Burn Pain in the Burn PopulationMost pain in the burn setting involves the use of medications that treat pain. The staff must first believe that if a patient states they are having pain that they mean it. Pain medications are also best given on a scheduled basis so that pain is covered over an extended period of time, rather than waiting for the pain to return in order to treat the pain. Pain medication in a burn setting should not be given intramuscularly because there is pain involved in getting the injection which could color the patient’s perception of pain. Intravenous pain relief is preferable in a burn unit setting and provides a reliable relief of pain. Oral pain medications can be used for mild to moderate pain. In the emergency phase of pain relief, the patient’s pain may be extreme, necessitating the use of strong pain-relieving medications. The staff also will need to manage the pain of procedures done to the wound. A patient can be given medications that are strong but that have a short duration of action and care must be given not to over-sedate the patient, which can result in respiratory depression. Pain treatment in the early phases of the management of burns is also important when it comes to decreasing the incidence of post-traumatic stress disorder in burn patients. Sedating the patient can be challenging during times when dressings need to be changed. There is the above-noted problem with respiratory depression and sometimes there is a need for keeping the patient away from foods and liquids prior to giving them strongly sedating medications. The ideal protocol for giving pain medication for procedures should be one that has a rapid onset of action, a deep relief of pain, and a short duration of action without major side effects. There are several established protocols which can be used to reduce the perception of pain during procedures. Pain Relief during RehabilitationWhen the patient is recovering and in the rehabilitative stage of burn recovery, there can be pain from contractures, including scarring and an aching pain, similar to the pain of arthritis. Mild pain relievers such as acetaminophen, codeine and oral anxiolytic medications should be used during this phase of healing. Ibuprofen and other NSAIDs are often preferable because they treat inflammation and are nonsedating when compared to narcotic medications. For chronic pain, acetaminophen has a good safety profile with few side effects. Itching also needs to be treated during rehabilitation. Many burn centers use diphenhydramine (Benadryl®) for the relief of itching as well as long acting benzodiazepines to treat the anxiety involved in itching. Methods such as guided visualization, biofeedback, and meditation can be used to manage the pain and itching that can last a long time after initially receiving the burn. Editor's Note: This page has been updated for accuracy and relevancy.